Metal Products Engineering specializes in the production of high volume metal stamping for aerospace, automotive and construction. Our specialty is tight tolerance and perfect precision. As contract manufacturers, we will fabricate to your exact specifications. Whether your metal stamping requirements include simple forms or highly complex component parts, we can meet and exceed your most demanding requirements. We have over 50 years experience in manufacturing difficult, complex custom metal stampings. Let us review your application and look for an achievable solution. Our engineering group has developed and designed solutions that have proven that dedication and innovation will ultimately conquer any task at hand. Metal Product Engineering has succeeded where others wouldn't even try! Whether it's a quantity of thousands, millions or somewhere in between, Metal Products Engineering has the equipment and resources to manufacture your precision metal stamping cost competitively. 14 precision metal stamping production presses ranging from 4 up to over 120 tons are available for your metal stamping requirements today. Metal stamping material thicknesses of less than .001" and up to .250" are achievable with our power press selection. Metal Products Engineering is also extremely versatile in the types of tools that we build and run. Partial list of Material Specific Stamping done at Metal Products Engineering. Our in house die maintenance program assures the highest quality parts and ability to make changes or revisions to production level parts expeditiously. 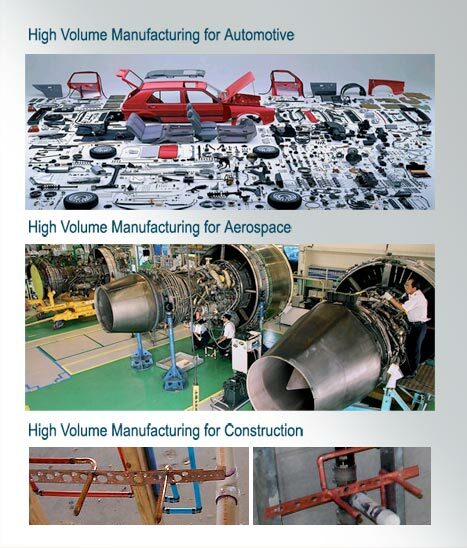 Rely on Metal Products Engineering for your most demanding parts.